Dreams can be very powerful. Some may be without substance, even insignificant but then there are the dreams that deeply impact the very core of your being. Hold fast to these! From humble beginnings in Ireland, George Lee s inspiring, dream-catching story soars through blue skies that include piloting Royal Air Force Phantom fighter jets, winning three World Gliding Championships titles, and taking HRH Prince Charles on his first gliding flights. 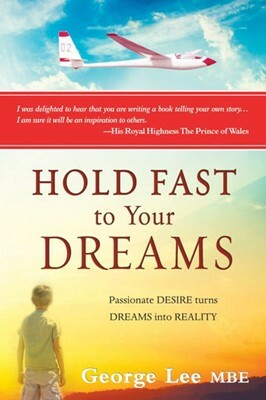 An intensely personal account, Hold Fast to Your Dreams is a witness to an ordinary man s passionate pursuit of his extraordinary dreams that lead him through the clouds of Europe, Asia, and the United States as well as into the back streets of Hong Kong and the halls of Buckingham Palace where he dines with The Queen. Believing strongly that people s choices determine their destinies, this high-flying and motivating true-life adventure is full of remarkable achievements as well as disappointments both creating foundations on which the author builds his exciting life of success and dream fulfilment. George Lee is probably the most focussed person I have ever met in life and has to be admired for his extraordinary application to the task in hand. Readers of this book will know him as a triple World Gliding Champion (Open Class), but many will not be aware that for a number of years he was an operational fighter pilot with the Royal Air Force flying F4 Phantoms where his application gave him the highest possible results. And in getting to that level, he did not have a straightforward ride and had to apply himself at every stage of his life to make the grade to become a Royal Air Force pilot; and not just any old pilot, but one of the very best. Although he writes about this in his book, his modesty has prevented him from making much of it—but I can and do so now. If ever there was a case of “pulling oneself up by the boot straps” then George is the perfect example. But I really only know George from his gliding where his application is legendary. As a one time member myself of the British Gliding Team, I once asked him what the secret was that had made him achieve success well beyond my own rather meagre achievements, and I remember that he replied on the lines of, “ I always set my sights on being World Champion and I knew I could achieve it”. He believed in himself and what an example he set by so doing. Looking back I did not have such confidence in my own ability and that is probably the most important thing that George’s success highlights. Attention to detail is something else I recall so clearly and can be seen in this little snippet from a World Championship. At the end of each flying day, the wings of gliders taking part would have hundreds of squashed flies along the leading edge of the wings and one of the tasks of each crew at the end of each day would be to remove the aforesaid flies to ensure optimum performance was achieved at the start of the next day`s competition. (This was in the days before “bug-wipers” had come on the scene). George’s crew would deliberately leave just one fly on so that the next day, when George checked his glider, he would have the satisfaction of discovering and removing it! Attention to detail is another of George’s characteristics that has set him apart from many others. The other one that is so relevant is that he was and is a superb pilot in the sense of being a “natural”. George, by his success in life of overcoming many obstacles and achieving his ambition, sets an example to all who aspire to achieve their own personal goals, and he also shows that one should strive for the utmost as only then will you discover what is really possible. And, when his time in the Royal Air Force came to an end, I must mention his extraordinary application in achieving a first time pass in his ATPL (Airline Transport Pilot’s Licence) sufficient to enable him to secure the one and only job available at the time with Cathay Pacific, and doing so in what must have been a near record time! Typical of him! This book is inspirational and is a “must” for all glider pilots and to anyone who aspires to achieve something in life but sees nothing but obstacles in his or her path.